Our belts are used globally by a wide variety of industries and are meticulously custom fabricated to meet specific applications. 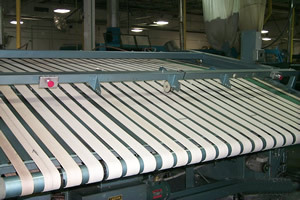 We utilize materials of the highest quality to manufacture finished, cut-to-length laced belts. Among our most common finished belting products you will find feed belts, folder belts, spreader belts, apron return belts, and conveyor belts. We also offer materials for our customers to make their own belts if they prefer. Our wide variety of finished products and stocked parts give us the ability to determine the kind of lacings and Storms' one-step, no fray bindinship that are most appropriate to our customers' needs.